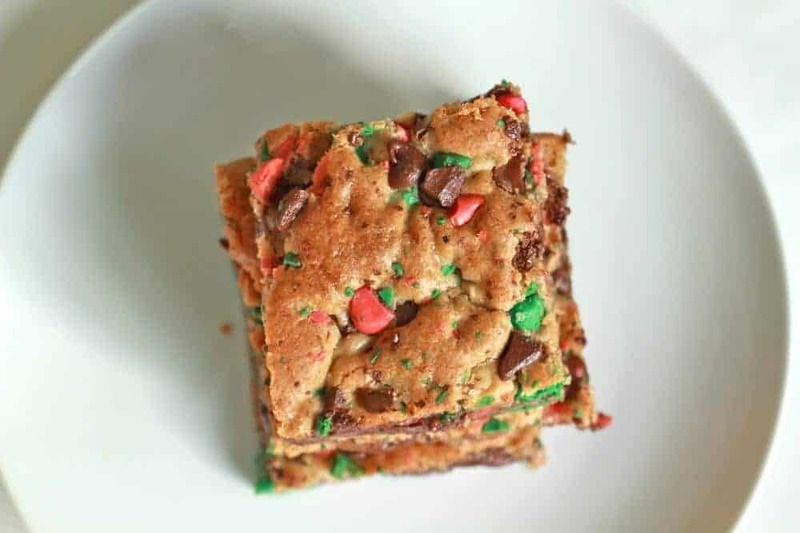 with some Christmas blondies….of course. I mean would you expect anything less? First can we have a little chat? 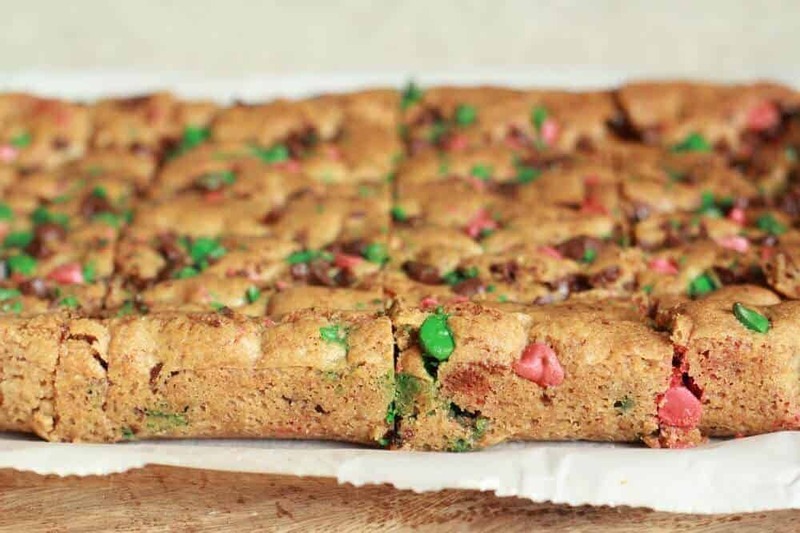 Why are Blondies called Blondies? Really, I can not figure it out. I mean I know some blondies do not have chocolate in them, so I can understand why those blondies would be called blondies. But what about the blondie recipes with chocolate? 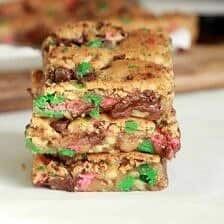 I mean are they really any different than a chocolate chip cookie bar? I do not know, but I am calling these blondies simply because the original recipe, that these were based off, were called blondies. I am pretty sure the only thing I did NOT change in the recipe was the amount of flour. Unfortunately though, I can no longer find the recipe. 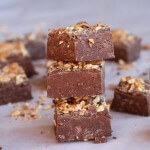 Moving on… I proceeded to make a giant mess in kitchen while toasting nuts, chopping chocolate and melting butter. Seriously, I have a problem. I can not follow a recipe! 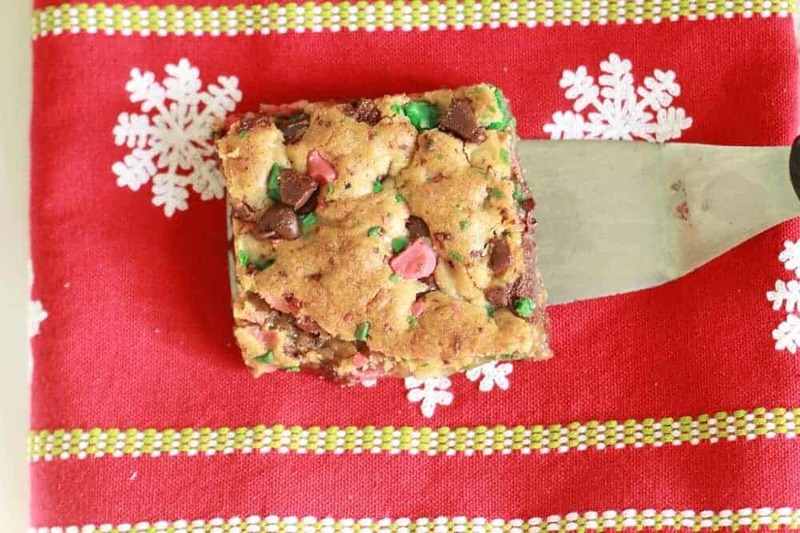 I adapted these yummy blondies to be a fun Christmas treat by using the Nestle Holiday Chocolate Chips. When I saw these cute little chips in the store in late October I snatched them up! Seriously, I bought like 5 bags! They were just too cute and you know I did not want them to run out! If sadly, your store does not carry these Holiday chips just use mini or regular holiday M&M’s, they are just as yummy and festive! 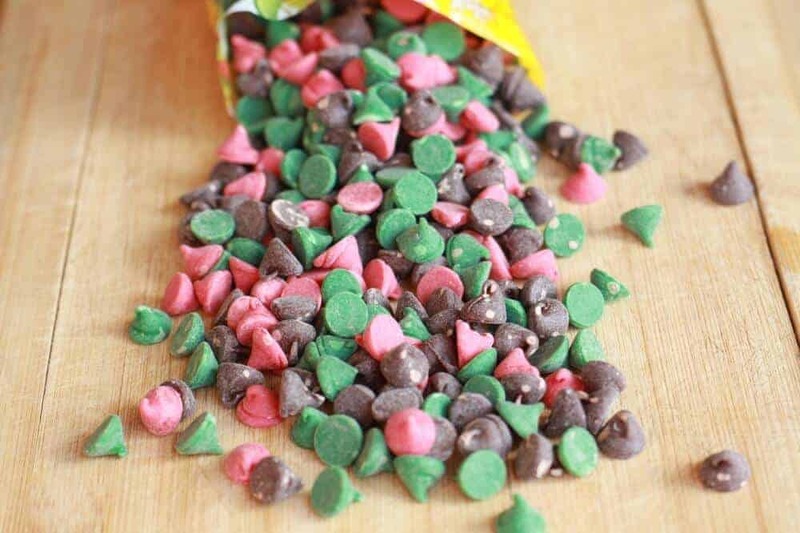 I used Holiday M&M’s last Christmas when the Holiday chocolate chips did not exist (at least in my neck of the mountains). 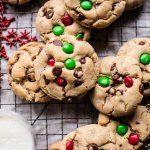 And if your are not into the holiday colors (um, really though don’t be a Grinch) or want to make these during the other 11 months of the year, just use chocolate chips! Whatever you decide, just make um! Line a 9x13 inch Pyrex pan with parchment paper. In a small bowl combine the butter, eggs, vanilla and milk. In a large bowl or bowl of a stand mixer add the flour, brown sugar, walnuts, baking powder, salt and coconut. Add the wet ingredients and mix until just combined. 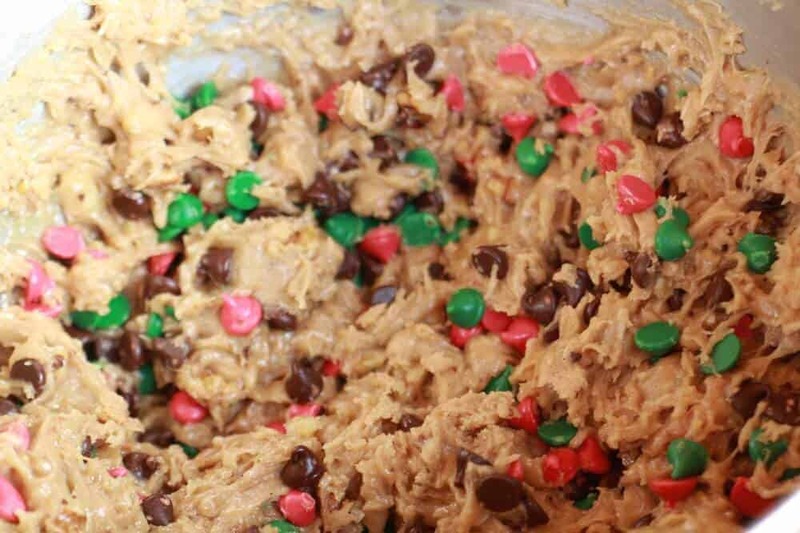 Add 2 cups of the holiday chocolate chips, or 1/2 cups of holiday M&M's and 1 1/2 cups chocolate chips. Pour the batter into the prepared Pyrex dish. 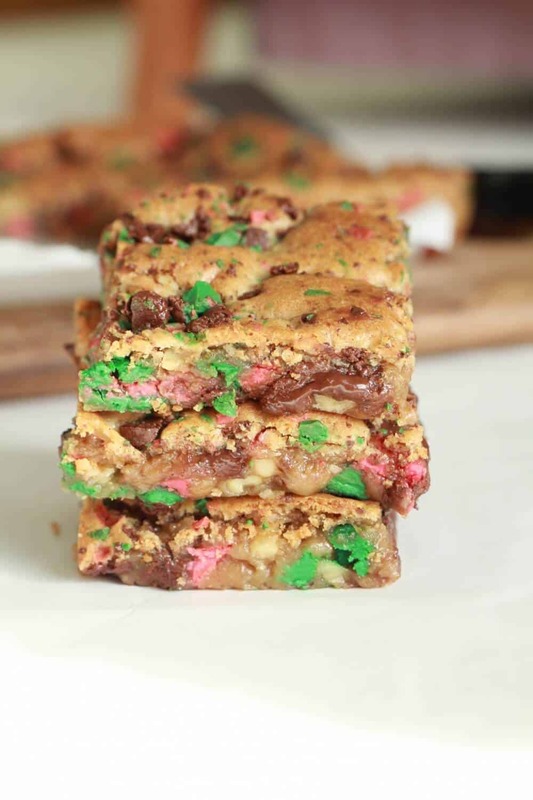 Chop the remaining chips or candies and sprinkle on to of the blondies. Bake for 30-35 minutes. Allow to cool 30 minutes before removing from the pan and cutting. 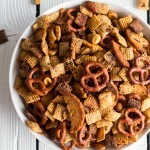 Mom’s Secret Christmas Eve Chex Mix. They look really good! Love the pretty colors for Christmas. Would appreciate if you could add a link back to Foodie Friends Friday! Thanks for sharing with us! opps! Sorry, been dealing with some crazy blog hiccups! These look awesome. Thanks for sharing on Foodie Friends Friday and would love it if you would link back to us. Remember to come back and vote on Sunday. Can tell they are delicious and they look so pretty too. thanks for sharing your recipes on foodie friday. We enjoy them. These look delicious! Thanks for linking up on Foodie Friends Friday. Please link back to us and come back Sunday to vote. 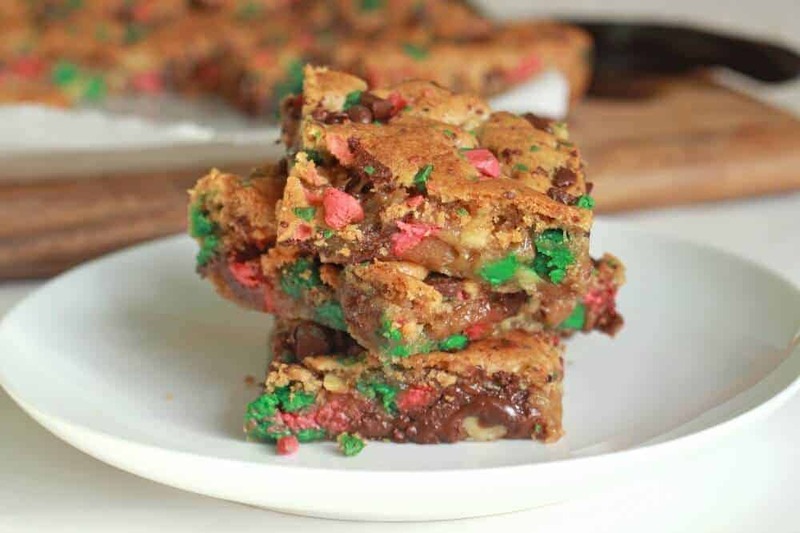 These look so delicious…and so festive! Yum! You are a baking Machine! I love it! They are normally so boring…love the colorful addition! 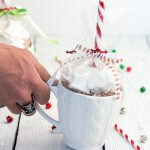 What a fun holiday treat! I was under the impression that they were called blondies to differentiate them from brownies? Maybe I’m mistaken? I’ve never seen those holiday chocolate chips before! They look so festive! Have these in the oven now!! I had a great blondie recipe years ago that I found on a blog and I only had it bookmarked, not printed out. I went back to the blog, and it was GONE. The entire blog was GONE, including that killer blondie recipe. I can’t wait to get these out of the oven and try them out! !